Please join us on Sunday, June 6th from 11:00am-4:00pm upcountry! I am honored to have my fine art featured at the June 6th Sunday Drive event up at the Tedeschi Winery and Ulupalakua Ranch from 11am-4pm. When Diana Azevedo from Ulupalakua Ranch and Paula Hegele from Tedeschi Winery invited me to be part of the event, I was delighted! The "Ulupalakua Inspires" show at the Sunday Drive focuses on fine art by Maui photographers who find inspiration in the rolling hillsides, open country and vibrant florals. Other featured photographers include Randy Jay Braun, Jimmie Hepp and Gwen Arkin. I'll post a gallery of images that will be featured in the show as soon as it is ready! Framed prints, gallery wraps, matted prints and loose prints will be available for purchase at the show. Special orders will also be accepted on site. Special thanks to Anne Wall from the Wailea Art Program for providing me with guidance in selecting the pieces to be featured in the show. The Honolulu Star Bulletin just posted an article on the event: "Ulupalakua Inspires" as did the Lahaina News! Celebrating the beauty that has captivated artists for generations. ULUPALAKUA – Maui’s Winery and Ulupalakua Ranch Store invite the public to come on up to Upcountry Maui for “Ulupalakua Inspires” on Sunday, June 6, from 11 a.m. to 4 p.m.
With the brilliant purple blossoms of jacaranda and agapanthus in bloom, it’s a perfect time to celebrate the natural artistic inspiration of this beautiful area. 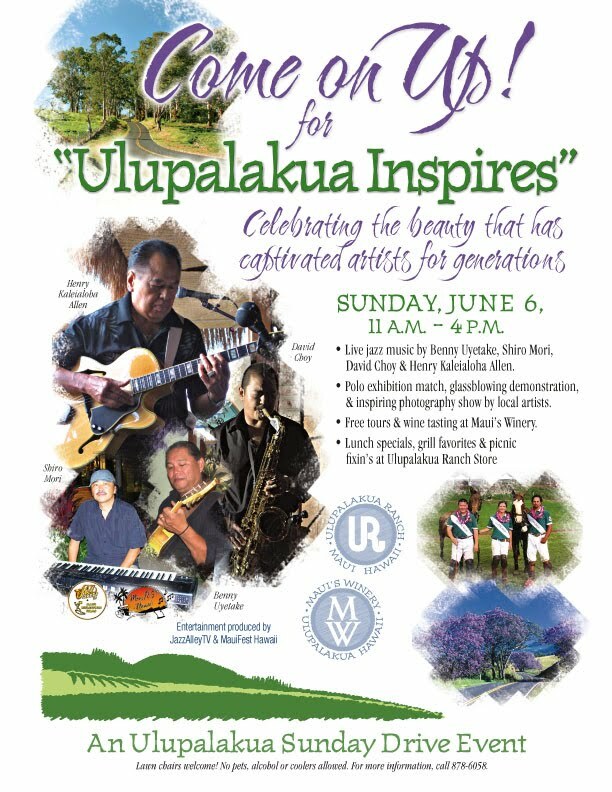 “Ulupalakua Inspires” is a free, community event featuring fun exhibits like a polo match, a glass-blowing demonstration and a photography show—all set against a musical background of live jazz on the picturesque grounds of the winery and ranch store. Local favorite Uncle Benny Uyetake opens the show at 11:30 a.m. and will keep his smooth Hawaiian stylings going until 3 p.m. on the lanai of the ranch store. Japan-born musician/composer Shiro Mori performs with his jazz quartet from 1 to 1:45 p.m.; and sought-after Hawai‘i saxophonist David Choy takes the stage with his quartet from 2 to 2:45 p.m. Master musician Henry Kaleaialoha Allen tops off the day from 3 to 4 p.m. with his trademark “tropical swing and a touch of cool jazz.” Among other accolades, Allen was named “The Master Artist” of the Hawaiian Steel Guitar and Hawaiian music by the Hawai‘i State Foundation on Culture and the Arts and by the Hawai‘i Academy of Recording Artists. All live entertainment is produced by Jazz Alley TV and MauiFEST Hawai‘i. If you’ve always wanted to see an authentic Upcountry polo match, here’s your chance: the Ulupalakua team will take on Keokea in an exhibition match from noon to 1 p.m. on the ranch polo field. The free event is coordinated by Ulupalakua Ranch cowboy Kaimi Kona‘aihele and his wife Ceci, who also offer polo lessons and clinics year round. Visitors are encouraged to wear comfortable walking shoes for the short hike from Maui’s Winery and to bring beach chairs or mats for seating at the scenic field. Maui glassblowers will share their unique art form with “wow”-inducing demonstrations of glassblowing throughout the day. Ulupalakua artist Randy Schaffer and Blow Your Mind Productions will showcase their craft on the stage of the upper winery grounds from 11 a.m. to 4 p.m. Visitors may participate in the creation of a custom piece that will then be fired in the onsite kiln and ready for pickup or delivery the next day. Another chance to be inspired takes place at the Photography Show, which features stunning photos by Ulupalakua and Maui photographers. Visitors can stop by the winery pavilion throughout the day to view photos by Jimmie Hepp, Aubrey Hord, Gwen Arkin and Randy J Braun—and even meet some of the artists who will be on hand to share insights into their work. If you’re in the mood for a picnic, you’ll find all you need at Ulupalakua Ranch Store Deli & Grill. Lunch specials from 11 a.m. to 4 p.m. include Maui Cattle Company burgers (featuring 100 percent natural, premium Angus beef raised on Maui), Ulupalakua Elk Burgers, the ranch’s famous Ulupalakua Steak Chili, and more. Free wine tasting is offered throughout the day in the historic King’s Cottage Tasting Room, with tours of Maui’s Winery beginning at 10:30 a.m., 1:30 p.m. and 3 p.m.
Ulupalakua hosts quarterly Sunday Drive events to share and honor different aspects of this unique historic area. In the spring, it’s “Ulupalakua Remembers,” celebrating the rich heritage of this historic ranchland. Summertime is “Ulupalakua Inspires,” celebrating the beauty that has captivated artists for generations. Fall is “Ulupalakua Cares,” celebrating the commitment to agriculture and open space in our community. And winter is “Ulupalakua Sparkles,” celebrating the arrival of the holidays with Maui-style gifts and festivities. Each event features live music on the beautiful grounds of Maui’s Winery, lunch specials at Ulupalakua Ranch Store, free wine tasting and winery tours, and opportunities to learn more about the area’s history and culture.